If I had to pick one city in the US that I would like to visit, it would be San Francisco (sorry San Diego, you come in second). It probably stems back to my first time there years ago when I visited an old friend who had moved there from Philadelphia. I stayed with him at his place for a week and we walked all over the city. My best memory of it was a Sunday morning when we took the ferry to Sausolito to have brunch. I enjoyed it so much that I try to take the ferry there every time I visit San Fran. This visit was no exception. It was late morning when my wife and son boarded the ferry and headed across the bay. As we passed Alcatraz, the fog began to roll in. For anyone who hasn't experienced this, it is a sight to behold. 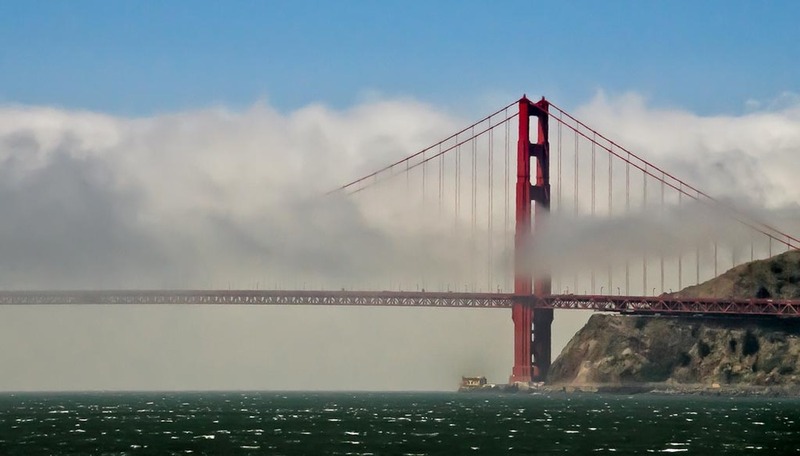 I snapped a few photos before the Golden Gate Bridge disappeared.